So this is the second time I’ll be seeing a Nigerian movie in the cinemas and wow! I’m totally glad I did. My first experience with seeing a Nigerian movie in a cinema was quite depressing. I can’t even remember the title of that movie now. That experience scarred my see-a-Nigerian-movie-in-cinema tendencies for a very long time. Then I started watching Ebony Life TV and fell in love with them (here’s a special shout out to the guys hosting The Spot show, Lamide, Ebuka & Zainab 😘). Ok, so ELTV produced a badass movie titled “Fifty” and as per the normal ELTV style now 😉 they made a whole lot of publicity around it. Ahem!! *clears throat*… If you watch ELTV, I’m sure you’re familiar with what I like to call their promote-it-till-they-dream-about-it tactics. Lol… It’s actually very effective. Hi five 🙋 ELTV publicity crew. To be sincere though, sometimes, it can be tiring especially for consistent viewers. Ok then I thought a movie by ELTV showing in the cinemas might just be worth my while this past festive season. Though the movie was originally premiered since the 18th of December last year, I decided I’ll take mumsy to go see the movie at Genesis Deluxe Cinema, City Mall. Now am I glad or am I glad I did! Wow!! Y’all nailed it mahn!! Every single effort put into the Fifty movie showed 200% and more. Fifty is a movie about 4 women, how they lived and loved. It showed how these women had relationships, heartbreak, deceit, betrayal, forgiveness, new beginnings, sacrifice, struggle with faith etc. and how they handled their trials & tribulations. The entire movie has an authentic blend of our African culture together with our Western exposure. It’s absolutely lovely. Fifty brought to light the beauty of our African arts and music shrine as it is still imbibed in our modern day life. I’m certain some people have forgotten these things are still a part of us. The story line was cool, though I must confess its real depth for me was in the story of Tola (played by Dakore Akande [Nee Egbuson]). The twist in her story at the end intimates the viewer with the reason behind her over-the-top, gaga-like behaviour that she displayed for the most part of the movie. There was also the holier than thou aunty Maria (played by Omoni Oboli) who castigated Tola and her ways. Who’d have thought Maria herself was nursing a tall chilled glass of jealousy towards Tola. The part I don’t get though is our madam who is so prayerful that she even believed prayers will cure her of cancer. Kate, played by the adorable Nse Ikpe Etim, was the last person I’d have expected to do the major tatafo o. Well, I’d say it’s not too surprising though, it’s just a call to reflection for all those that live and breathe the church but still go about ratting on other people. I would have thought Elizabeth “Lizzy” (played by Iretiola Doyle) would have been the one to do the honours. We could also see in Lizzy‘s part of the story, the struggle between a 21st century mother enjoying all the perks of youth even though in her fifties. You know, the general idea in Naija is that a woman is expected to slow down on certain pleasures of life once she reaches a certain age. What a stereotype *roll my eyes*. In Fifty, we were also able to see how Lizzy never gave up till she and her daughter could find a common ground to love in their own way. By and by, one of the messages I got from the movie Fifty, is that, we all have our reasons for doing some things but it’s never too late to reevaluate how we go about doing those things. Because I think our actions sometimes, affect so many other people than we can imagine. So, let us all analyse that “Fifty” crossroads in our lives as soon as possible. Oh, and one of the scenes I think almost every Naija girl can relate to is the one where Dr. Lizzy was signing her autograph on students’ books then one of the students replied excitedly when asked her age; “I’m 22, 23 by October” …erm I’m not entirely sure I got those figures and month right o 😋… But that scene reminds me of how we’re so eager to be older then when we finally get older, we start wishing we could be forever young. Let’s live every moment or phase we find ourselves in, to the fullest. Absorb all there is to learn and cherish, heal from hurts that may impale our forever afters etc. I must say though, that Fifty seemed somewhat incomplete to me sha… not in a bad way o. But incomplete like a TV series should be made around the story, dissecting the lives of these four women we came to know and relate so much with within 1 hour 45 minutes. The production of Fifty was absolutely brilliant! 😘 Thanks to the brains behind ELTV, the writer of the Fifty script, the movie director Biyi Bandele, the entire production crew and especially the executive producer Mo Abudu, for their remarkable effort and also for restoring my faith in seeing Nigerian made movies in the cinema. Now I feel a little more reassured about the next Nigerian movie I’ll see in the cinema. Thanks my darling readers 😘 do let me know your thoughts on seeing Nigerian made movies in the cinemas. 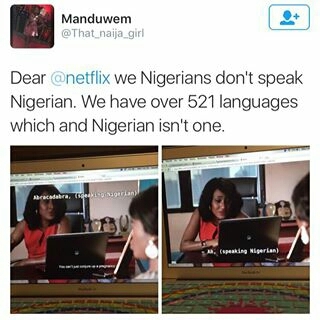 Honestly, I’m not a BIG fan of seeing Nigerian movies at the cinema… no offence though, its just a personal choice. However, it is worthy to note that I have never been disappointed at any time when I was compelled to see one by a “female companion” and I am actually going to make a conscious effort to see Nigerian movies and support our very own Nollywood. By the way Fifty was fantastic, I watched the premiere on ELTV and was sold, might be I’m a sucker for Nigerian beauty. By the way, nicely done Nike!